This article suggests that ugly cities are the result of poor political leadership. That seems like a long bow to draw. I believe the cause of ‘ugly city syndrome’ is more subtle, and maybe we just have ourselves to blame. The simple answer might be that in the modern day of cheap international travel we are comparing ourselves to a wider selection of cities. But where are the incentives to create a beautiful city? Since the cityscape is jointly determined by public investment (the quality of public space including vegetation, materials, size and layout, also roads, and other hard infrastructure, and finally, public buildings) as well as investment by private land owners, let’s deal with the incentives for each separately. First, there are the incentives for public investment in beautification. Governments of all levels are in the unique position to justify extra spending to enhance city ‘liveability’. And these investments by governments do happen. Land at Kangaroo Point, for example, has recently been reclaimed for use as public parkland. But governments do face one major constraint. People demand wise use of public money, and spending on beautification, above and beyond functionality, is often frowned upon. But what about private investment is the attractiveness of the cityscape? Like all positive externalities private supply of urban beauty is always suboptimal. There are plenty of examples of suboptimal supply of public beauty. Below is SL8 in West End, which just happens to resemble the exhaust stack of the new road tunnel (as does Urban Nest at Southbank for that matter). Why are private companies building apartments that look like elaborate exhaust pipes? The answer must simply be because people will buy them. 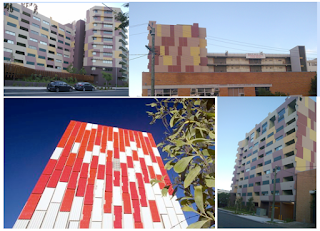 Since inner city apartments are commonly purchased as a pure investment decision, based entirely on rental income and tax benefits, and because renters are less critical of the appearance of their building (especially if they are short tem occupants), then there a few reasons for developers to spend more on external appearance. How do governments provide incentive for private investment in the cityscape? I am not a fan of any type of design review board or some such oversight – taste is personal and I am happy to see a diversity of design (which is exactly what is missing). In fact, apart from developer contributions to public space I see no way around this beyond an improvement in taste of the property investment community. I frown on regulations such as the requirement of a contribution to public artwork for new buildings – can’t the building itself be art. What opportunities exist for creating a better looking city? In this day and age, I believe that good artists do not receive adequate outlets for their work nor recognition and admiration. Sure you have popular bands who make music and sell records but nothing modern is able to inspire awe in me like a really old cathedral or castle or a quality piece of classical music. If the community were not so focused on individual wealth and keeping up with the Jones's we could band together and encourage young artists to produce momumental creative works of beauty lke the civilisations of old.